alaTest has collected and analyzed 33 reviews of Panasonic HDC-HS200. The average rating for this product is 4.3/5, compared to an average rating of 4.1/5 for other Camcorders for all reviews. Reviews about the durability and size are overall positive. The portability and image quality also get good comments, whereas there are some negative views about the zoom and reliability. There are some mixed views about the memory. We analyzed user and expert ratings, product age and more factors. Compared to other Camcorders the Panasonic HDC-HS200 is awarded an overall alaScore™ of 84/100 = Very good quality. The Panasonic HDC-HS200 high definition camcorder can capture great-looking footage, and it's good value too. At AU$2,299, the HS200 sits at the top of Panasonic's new camcorder range. With a 3MOS sensor and 80GB hard drive, we think it might just make up for the company's previous HD offerings. Thanks for sharing this post. 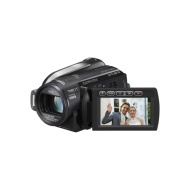 How about the sony camcorder with feature 3ccd Camcorder? What is the difference bewtween this two camcorders? I'm a bit curious on a 3ccd feature. Is there any idea on this? Thanks. Panasonic may wish to consider including a small case with these high end models in future as was difficult to find a belt mounted case to use when walking around.